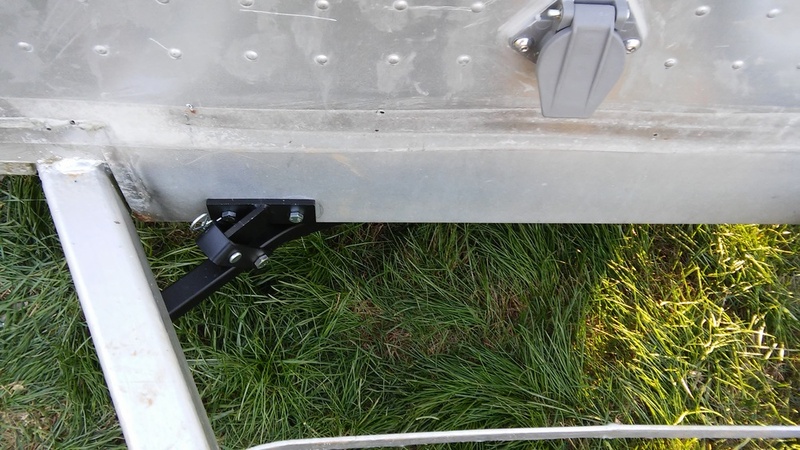 Our Airstream is designed from the factory to accept this tire carrier. There are two threaded fittings built into the frame to attach it. I wasn't able to find a good diagram of where/how the front attaches, so here are some pictures. The install instructions look like the bracket attaches to the A-frame, but it doesn't. The bracket bolts onto the bottom of the front hold-down plate. See the ~1/2" space between the top of the handle and the bottom of the A-frame? When I supported the fittings from below to line everything up, I had the handle touching the A-frame. When I installed it, it dropped about 1/2". That space is just the extra "wiggle" in the fittings. If I had known that, I would have installed the mounting bracket a little higher so I could get the carrier as far off the ground as possible. The instructions say to install the bracket an inch from the bottom, but they don't say whether that's the bolt hole or the bottom of the bracket. Not a big deal, but now I have 1/2" less clearance than I would otherwise have. Speaking of clearance, I'm not thrilled about how little clearance I have between the tire carrier and the ground. It's a factory design, so it must work OK, but I'm concerned about scraping when going over a hump in the road. I considered trimming the end off the handle so it didn't hit the A-frame, which would get me another inch or so of clearance, but then I realized that would be a very bad idea. If I do bottom out on the tire carrier, I want the handle to hit the frame, not the tire to hit the plywood floor above it. You can see here how much clearance I'm losing. The grass is kind of high and the tongue is dropped quite a bit because I'm parked on a slope, but nevertheless, it's a significant loss of clearance. I've seen folks post on airforums that the geometry of the tow vehicle and trailer makes it nearly impossible to scrape the tire carrier, so I'll leave it there and see how it goes. It definitely does limit how low I can drop the tongue to level the trailer on an uneven surface. But, it's reasonably easy to access, and it avoids having to store the tire in the tow vehicle.